The benefits of hypnotherapeutic methodologies and practices, their place within existing professional practices, and as a natural extension to existing practices, is becoming increasingly recognized. 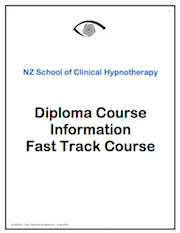 In recent years, the NZ School of Clinical Hypnotherapy has received many more inquiries from those in professions such as counselling, psychotherapy, psychology, and psychiatry, and these practitioners have expressed interest in adding Clinical Hypnotherapy to their Scope of Practice. These practitioners have recognized the benefits to their clients and to themselves, of incorporating Clinical Hypnotherapy into their practices or adding Clinical Hypnotherapy to their existing skill set. Previously, clinical practitioners have entered the School and have been trained through the Standard Diploma Course, and have been granted RPL (Recognition for Prior Learning) for their qualifications and experience. However, due to increased demand, the School designed a tailor-made diploma course option for those professionals already working in clinical practice who wish to add Clinical Hypnotherapy to their Scope of Practice. This course option, whilst still incorporating the important necessary components of the Standard Diploma Course, recognizes the qualifications and experience of those who will enter this course. One of the major benefits of this Fast Track Course is that motivated practitioners complete this course in a 6 month time-frame!